This is one quart of Traxxas Top Fuel 33% Nitro Fuel. Traxxas Top Fuel has been specifically formulated to provide optimum performance and lifespan with Traxxas Engines, and is made specifically for cars and trucks. Cars and trucks place incredible demands on engines and fuel. Top Fuel uses both castor and synthetic oil. Synthetic oil provides excellent high-tech lubrication for your engine and allows rapid throttle response. Castor oil provides additional high temperature lubrication and over-lean protection. The oil percentages are specially balanced to provide just the right amount of lubrication for long engine life and to provide the crisp clean throttle response you demand in a car fuel. 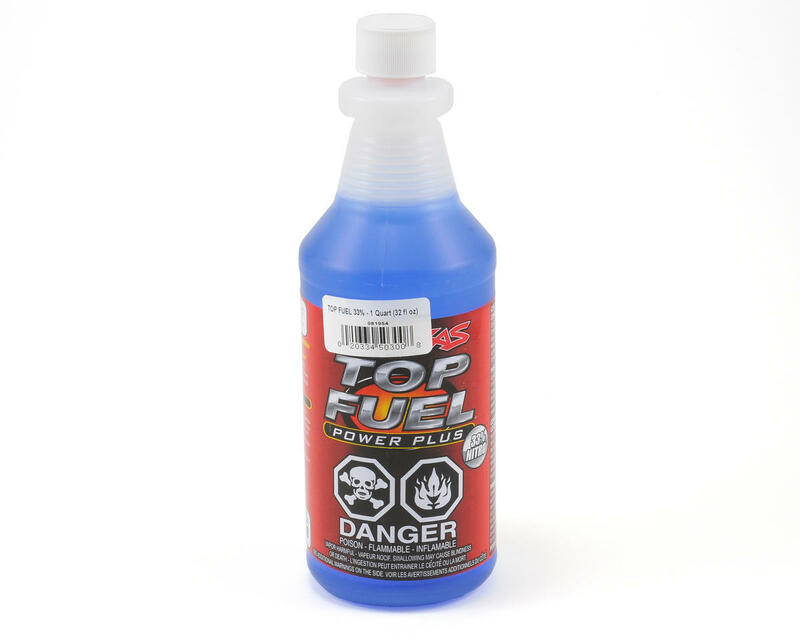 Top Fuel also contains anti foaming agents and corrosion inhibitors to maintain stability and peak performance in hostile Nitro environments. The long-term performance reputation of Traxxas engines is on the line with each tank of fuel, so you can be confident that the lubrication package in Top Fuel Power Plus is going to be just right, time-after-time. Top Fuel Power Plus is the only fuel that is specifically formulated for maximizing the performance of Traxxas engines. Traxxas certifies that Top Fuel is simply the best fuel for your Traxxas engine. Top Fuel is a premium fuel and may not be the least expensive fuel you can buy. The reason, it takes the highest quality ingredients and sophisticated blending machines to make a superior-performing fuel. Saving a few pennies using lower grade ingredients or widening the blending tolerances with lesser machines just won't do when it comes to Top Fuel. Our engines are precision machines built to exacting tolerances. The fuel must have the same intense requirements for quality and consistency. Only the absolute highest grades of methyl alcohol, nitromethane, and lubricants are used. Traxxas Top Fuel 33% adds 10% more nitro than standard 30% racing fuels, delivering even more power and acceleration from just about any nitro engine. Some 30% racing fuels make you sacrifice lubrication and engine life in order to enjoy the benefits of higher nitro. Traxxas fuel gives you the same great protection and engine life you expect with all the performance benefits high nitro racing fuel has to offer. I normally ran odonnell 40 and 50% race fuels in my hyper 7 but I bought a new tmaxx and revo so I tryed this fuel. I put a picco .26 maxx in the t maxx and an OS .21 tm in the revo. I had tuning problems to the extent that I called ofna and sent the picco in for analysis, the first thing he asked me was what fuel do I run. When I told him traxxas he said thats my problem. He put byrons fuel in the engine and had it tuned in minutes.I put odonnell in my revo and tuning issues were gone. I even had issues with the stock 3.3 motor running this fuel. This fuel is great!! Been running it in my traxxas nitro 4tec 3.3 for many years no issues with the fuel or engine...easy tuning and temps around 275 and the engine seems happy! Works great... For cleaning out my carb on my TRX 2.5 engine for rebuilds and cleaning... higher nitro content= more effective cleaner/degreaser... plus when i am done with the fuel i used for cleaning.. i burn my leaves and papers with it (beneifts of country living with nobody around lol!)... but be careful, one stray ember WILL cause ANY nitro fuel to BOOM (the fresher the fuel and also higher the nitro the more aggressive it burns)! Ask my dad when i gave him 10% nitro top fuel and he poured the fuel from the can into a little cup about 15 feet away from an open fire/flame... fumes from the fuel made a rather scary pop as the can EXPLODED and some of the fuel still burning landed on his foot and nitro fuel has a little oil in it so it burnt/singed the top of his foot a little on the top and the boom made his ears ring a little... luckily this was only 2 cups of 4 year old 10% nitro (I have 33% that i use for cleaning and almost 3/4 of a gallon but left uncapped a little long...)... another reminder: Do NOT leave fresh nitro fuel uncapped for long... You WILL ruin the fuel!